Just days after President Donald Trump’s inauguration, activists from Greenpeace climbed up a large construction crane near the White House and unfurled a large banner with the single word: Resist. On Feb. 11, thousands of protesters used their bodies to spell the word “resist” on a San Francisco beach. The next day, at the Grammys, rapper Q-Tip yelled “resist” no less than four times from the stage. All of these examples speak to a widespread and resolute discontent with the election of President Trump. They express a rejection of his agenda and of what they see as his degradation of our democracy. “Resist” reflects their desire, insofar as they can, to stop this from happening. But what exactly does it mean to resist? And most importantly, how can Americans make sure that their resistance is most likely to effect change? I have studied the words and actions of Martin Luther King for decades. 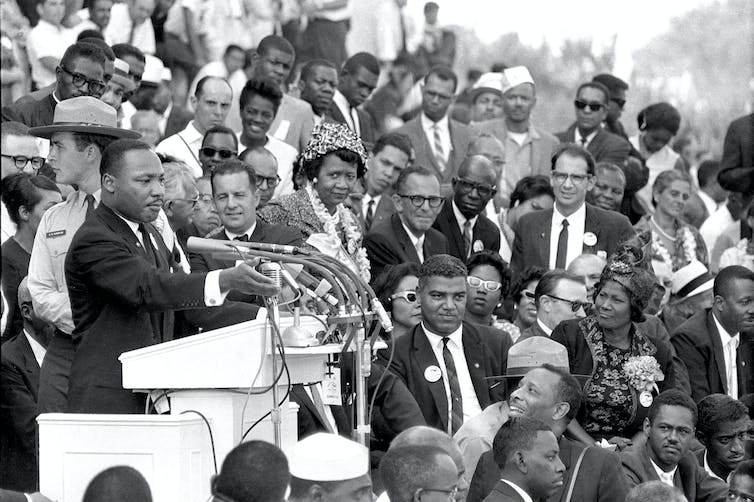 King led one of the most successful, nonviolent resistance movements in American history. I believe his example is especially germane to these questions. What can today’s resisters learn from King and the civil rights movement? The word, “conservative” has a specific meaning here. King was a democratic socialist, he opposed the Vietnam War and he called for massive investment in the inner cities. He was not conservative in any political sense. But what Meier showed was that King nevertheless manifested a conservative core – one that resonated with millions of Americans and thereby helped achieve the movement’s remarkable success. King’s resistance was also strictly nonviolent. Following the model of civil resistance developed by M.K. Gandhi, leader of Indian independence, King argued for nonviolence within the terms of his own Christian faith. But King also insisted that nonviolent resistance spoke to a respect for the law that can only be called conservative. In his Letter from Birmingham Jail, where he was imprisoned in 1963, King insisted that while unjust laws must be broken, they must be broken “lovingly,” such that the act demonstrates a respect, even a reverence, for the law. Conducting the struggle "on the high plane of dignity and discipline,” dressing well, using respectful language and accepting violence without responding in kind: All this gave protesters a moral standing that attracted moderates to the cause. It also sought to change the hearts and minds of the bigots, but even if that effort failed, the bigots were nevertheless defeated. The notion of conservative militancy likely does not, however, resonate with today’s resisters. For many of them, this moment is an opportunity to grow and strengthen the left either within or outside the Democratic Party; for some, it is an opportunity to move beyond the two-party system altogether. But within the civil rights movement, similar designs were often met with the operating principle: Keep your “eyes on the prize.” What it meant was that individuals should not allow themselves to be distracted. Rather, they should continually orient themselves and their actions such that they advance the movement toward the ultimate goal. Right now, many Americans contend that longstanding democratic procedures, norms and ideals are under attack. Because they seek to defend those core American ideals, those who resist have become, by default, conservatives and patriots. Contemporary resisters would therefore do well to remember King’s example. By accepting their own role as “militant conservatives” and accommodating their actions accordingly, they are more likely to resist effectively, and thereby achieve the ends they seek.